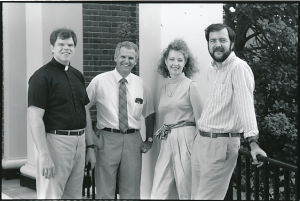 Ed was Wake Forest chaplain because he loved working with students. He had a genuine curiosity about the student experience. He wondered if Wake Forest was serving students in a meaningful way. Was it holding up its part of the bargain? Was it providing the opportunity for students to shape their own future, spiritually and philosophically as well as intellectually? 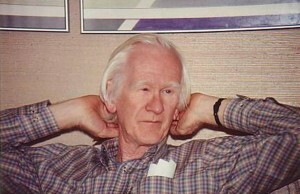 One example of this interest was an informal survey he wrote for seniors in the spring of 1991. This was an invitation for them to reflect upon their experience as undergraduates at Wake Forest. Ed’s ‘senior survey’ questions included: (1) What are the manifestations of community at Wake Forest? (2) Has college helped or hindered your development of a sustaining faith in God? (3) Parents often say, ‘All I want for my children is to be happy.’ Compare what parents mean and what you think happiness is. (4) Wake Forest recruits diversity but encourages conformity. Agree or disagree? (5) Should there be a ‘rite of passage’ for seniors which integrates their experiences? If so, describe it. (6) Who or what lasts? 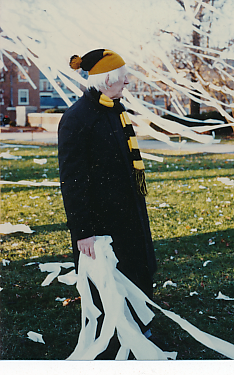 Ed led the campus in celebration of big basketball wins, such as this one in 1986 when he was 57. Photo by Kim Christman. Ed admiring the victory decorations. 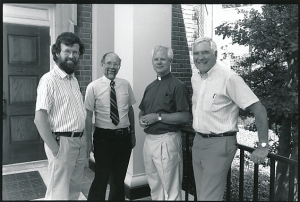 In 1983, Ed wrote a Five Year Plan for Campus Ministry. The goals reflect growth and needs for the group of then five ministers plus Ed, and the desire for broader programming. 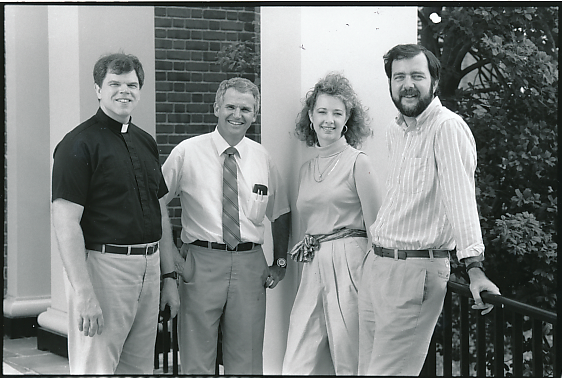 Campus ministers 1990: Bob McGee, Stuart Ellis, Marnie Houff, Doug Kearney. Photo by Susan Mullally. Campus ministers 1990: David Fouche, David Riffe, Curt Kremel, Henry Cooper. Photo by Susan Mullally. Among the needs noted were: office space to house all ministers in the same location; a new full-time staff person to serve as secretary for Campus Ministry (in addition to the Chaplain’s secretary); more information on student religious values and career interests; and the need for master keys. There were always plenty of nitty-gritty details about space and access. Programs proposed included: a weekly 20 minute devotional program, in Reynolda Hall, to serve Wake Forest staff; faculty/staff retreats for discussion of spirituality and service; a faculty advisory committee to give feedback on current programs and help initiate new ones; church vocations programming; possible link of chaplains with specific residence halls for formal or informal contact; and a more structured form of crisis intervention, whereby chaplains would share time being on-call to work with residence life, health service, and campus security staff as needed. In addition, a student service corp (to become Volunteer Service Corp) was under discussion. The Volunteer Service Corps (VSC), 1989: the VSC was formally created in in 1989 as a project of the Chaplain’s office. Inspired by student interest, and funded through an alumni bequest, Ed worked with alumnus Henry Cooper (’54) and with a group of students, including Libbey Bell, Matt Rubello, Mary Beth Torbett and others, to create the VSC. The organization was designed to provide the structure and opportunities for service that would encourage participation among students, faculty, and staff at Wake Forest. The Volunteer Service Corps was part of the Chaplain’s office and budget during its early years. Ed and Henry were able to bring it forth, find an office, some funds, and a catalog listing — and this creation made Ed very proud. This initial funding and success of the VSC led to formal university support, and in 1993, the program was moved to the Student Development Office. 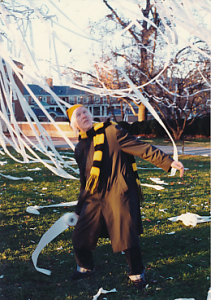 Henry Cooper’s pivotal role as first coordinator of the VSC was later celebrated through the Henry Cooper Service Award, given each year to the WFU graduate who best exemplifies a commitment to service. 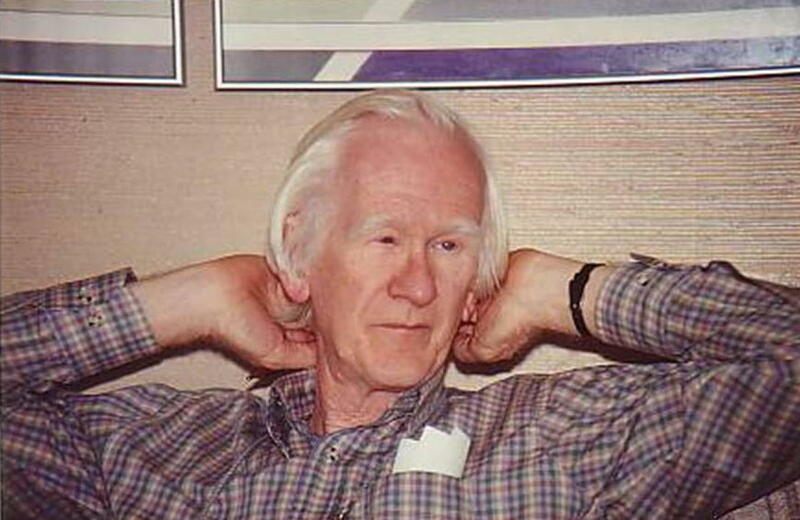 Cardiac Rehab Progam, 1994-2009: Ed joined the Cardiac Rehab exercise program in 1994 after having quadruple bypass surgery, and he remained a member for 15 years. He loved the people — some old friends including David Levy — and many new ones. He appreciated the work of the staff, including students, and the variety of people who would accompany his mornings on the track. Being a part of this program gave him yet another way to participate in the campus and city community. Special Convocation and Prayer Service at the Initiation of Gulf War, 1991: Ed organized a Special Convocation and Prayer Service at the initiation of the Gulf War (“Desert Storm”) in Iraq and Kuwait. This Special Convocation and Prayer Service was held on Tuesday morning January 15 at 11am in Wait Chapel. As well as considering the issues of war and peace, the service also recognized the names of those from the Wake Forest community who were serving in the Middle East. President Thomas Hearn, Professors Greg Pritchard and Susan Borwick, Dean Harold Holmes, Pastor Richard Groves, and students Lisa Joines and Elaine Massey were among worship leaders. Holocaust Memorial Service 1993: At the service held on April 15, 1993, Ed offered this Benediction prayer, “Depart from this place in full remembrance of death and life. Depart with God’s mark of Holocaust on each of you and me. May Almighty God continue to love and bless us, survivors of our own win. May God forgive but never forget any of God’s children until the Messiah comes. Shalom, my friends, Shalom.